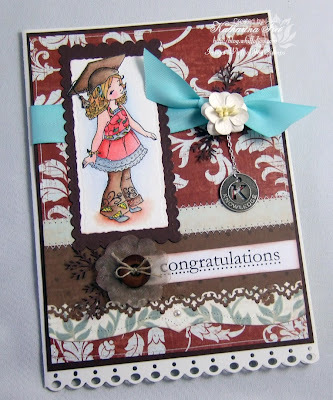 I needed to create another graduation card, but I also wanted to use one of the new Whiff of Joy Stamps from the Elisabeth Bell summer stamp kit. So I simply used my beloved graduation cap stamp from High Hopes Rubber Stamps to dress Willow up :) That was a lot of fun and I am very happy how perfectly the stamps matched. The card is A5 size again, I like to do big cards for such commissions. The paper is from My Mind's Eye (Bella Bella collection). I used some different Fiskars border punches and a Spellbinders Piercability die to get the rolling border with the halfpearl in the middle. Die Karte ist wieder A5, ich mache gerne größere Karten für Auftragsarbeiten. Das Papier ist von My Mind's Eye (Bella Bella Collection). Ich habe verschiedene Kanten Stanzer von Fiskars verwendet und ein Piercability von Spellbinders für den sanft geschwungenen Rand mit der Perle in der Mitte. 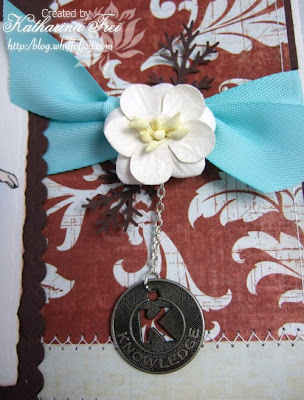 The sentiment is from Stampin' Up, the lucent flower and the button is from a Making Memories "flowers and button" jar. Der text ist von Stampin' Up, die durchsichtige Blume ist aus einem Making Memories "flowers and button" jar. I also decorated the inside of my card. 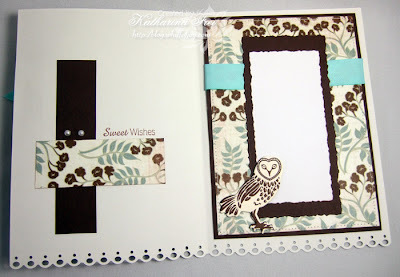 I could resist to use another owl chipboard from tattered Angels, it fits the theme so perfectly ;) The sentiment was also included in the Whiff of Joy / Elisabeth Bell Summer Stamp kit. Der Text war auch im Whiff of Joy / Elisabeth Bell Sommer Stempel kit enthalten. Danke, dass ihr Vorbeigeschaut habt. Die Karte ist superschön.Ganz toll gestaltet und die Farben harmonieren wunderbar!Klasse wie du die vielen Stanzer kombiniert hast! Oh WOW Katharina! How beautiful this card is. I just love every little detail of it and how wonderul that the graduation cap fits so perfectly. Once again, I am in awe of your creative talent! She really does look great in her graduation cap :) Neat idea. Looking at all of your cards with the new set now I cannot think of why I thought that I will not get the set. SUPERSCHÖN!!!! Und was für eine geniale Idee (und die Umsetzung erst!) einfach per Maskierungs-technik die Kappe und Willow zusammen zu bringen.. das passt echt perfekt! the card looks amazing katharina! Absolutely stunning-such attention to detail makes for a very impressive card!Love how you put the cap on Willow! I am excited to get my kit hopefully this week! This is spectacular, as usual. Love the new stamps! Beautiful card. Love how you put the cap on. Fabulous colouring and layout. What a great idea and how perfect the stamps are together! The receiver of this card got a unique card! Love the embellishments also. That is a gorgeous card Katharina. soooo cute! Love all the details! How beatiful!! That hat is perfect!! What a perfect match...may have to check that one out myself! I have these papers and just love them. I love the rich colors and you did a great job pairing them together. Awesome! Eine wunderschöne Karte! Mir bleibt echt fast die Luft weg - ich bewundere deine Kreationen immer wieder. Kannst du mir bitte verraten woher der "knowledge" Charm ist? Sorry die Frage hat sich erübrigt - es muss das "Token" von Tim Holtz sein, richtig? Beautiful card Katharina and I love they way you have done the bottom, how did you do that. Wow, she is Sooo pretty. Love your coloring! Great card! I had to make a few graduation cards, that adorable cap would have come in handy!! Love the size too!